The Fine Amber Jewelry pieces on this page are all exquisitely hand crafted, music related, objects of art (objets d'arte) created by skilled masters in Poland. 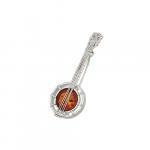 The age old amber is carved into several musical instruments trimmed in sterling or used as notes or decorations that enhance the primarily sterling pieces. Some are only one of a kind and are not available on a regular basis. 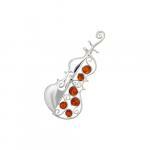 Many are sweet creations of the company "Amber by Vessel" and are in stock. 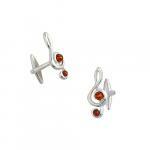 These are conversation pieces that will be treasured by their owner. Some amber pieces are on this page are available in a lovely green tone as well as the honey. If so, you will be able to select your preference in your cart.